How much beer is too much beer? I don’t know (and I don’t think anyone does), but I can confidently state that it’s at least possible that we’re approaching that point when it comes to craft beer. I know it seemed like there could never be too much craft beer. Every new brewery on the tap list was a joy to see, and we could simply enjoy this new beer wonderland we were living in. A huge and diverse Beer Savanna was ours to relish. How could we ever feel crowded on it? The problem is that “number of breweries” isn’t the right metric. The right metric is production per capita, especially when we factor in overall rates of alcohol consumption, and consumption of beer, particularly. If we want to know if a “crunch” is coming in the craft beer world, we need to assess how much beer we’re making per person, and how much beer those persons are drinking (or could be drinking, if we market well). Bottom line up-front: it's more than ever, for a smaller relative audience. Pre-prohibition, we had a lot of breweries. What we didn’t have were massive production breweries. You had lots of local and super-local breweries, but not many big-time regional breweries and few real “national” breweries. Today, we have a lot of breweries. Most craft breweries are locals, as in the heady days of 1919. But in addition we have regional craft and non-craft breweries, and of course we also have the mega-breweries of our macro friends. So, even with the same number of breweries, we can’t say that the number of breweries compared to the number of people gives us a good sense of whether we’re overproducing. Let’s go to my preferred metric: production per person (PPP), measured by the ratio of barrels produced (or in the market) to population. In 1919, the year before Prohibition, the US had a population of 105 million. It also had a little more than 1,000 breweries, down from a peak of about 4,000 in the late 19th c. (Brewers Association “Historic Number of Breweries,” Beer Advocate “History of Beer in the US”). This contraction was due in large part to improvements in refrigeration, allowing for and, indeed, leading to some brewery consolidation. In that year, US beer production was approximately 68 million barrels (Beer Institute – Statistics). That leads to a PPP value of 0.64 (barrels per person). Fast forward to today. True, our population is larger – approximately 320 million (2016). Production, however, has increased to 216 million barrels, which means that our PPP measure for 2016 is 0.67, which slightly exceeds our pre-Prohibition number. And as we know, the number of breweries opening each year is growing, and existing breweries are increasing their capacity. Production is growing faster than population growth, and faster than any fall-off in macro beer consumption (in case anyone was going to claim that craft was simply taking up the slack being lost by macro beer). And, as one final objection head-off response, “what about exported beer?” The US Department of Commerce report for 2016 shows that the US imports more than six times as much beer as it exports (roughly 33 million barrels imported, against 5 million exported). Factoring in total “beer in the market,” then, we add a net 28 million barrels and the PPP ratio rises to 0.76. I don’t know how much beer is too much. I do know that, per capita, we’re looking at more of it in our market than ever. We now have, on average, an extra beer in every six-pack as a percentage of beer-to-population, as shown by the PPP measure (0.64 in 1919, 0.76 today). If the beer-buying public has grown, though, then that may not really matter. Unfortunately, it doesn’t seem like that’s the case. Yes, the growing popularity of craft beer has led some who previously shied away from beer to jump back in. That rapid, double-digit growth has slowed, though, and at an inopportune time: more than 1,000 new breweries are firing up their kettles this year alone. From the high-altitude demographic perspective, beer is in a bit of a hole. It’s looking down the barrel of a bad population pyramid, given the preferences of each demographic group vis-à-vis its alcohol preferences. 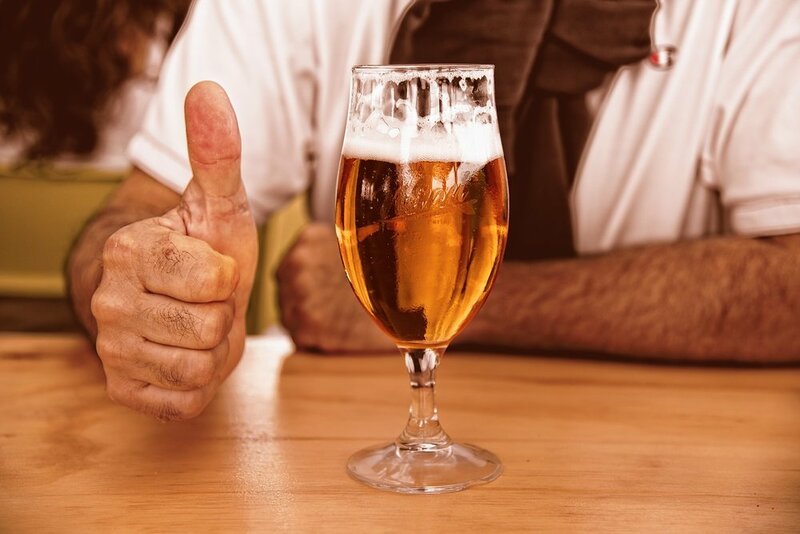 When asked by Gallup their first-choice preference for alcoholic beverages, about 70% of people 50 and older chose beer. Twenty years ago, that was also true of those age 18-29. Today, though, that number (while still at about 70% for older drinkers) has dropped by thirty points among younger drinkers. Fewer than half of younger drinkers are choosing beer (around 40%). That drop has hopefully hit its floor (with a slight increase last year), but a dramatic recovery to the 70s seems unlikely. Then there’s this: fewer Americans are drinking alcohol at all. The percent that are at least “occasional” drinkers has dropped from a high of 71% in 1978 to 64% in 2014 (the last year available in Gallup’s time-series data). The difference, again, has a significant age-related component: the drop is nearly entirely accounted for in the younger demographic groups, with those 50+ showing consistent drinking habits. The short version, then, is that we have a grayer, drunker population than we used to. Given the size of that group – baby boomers – we have something of a buffer in terms of consumption. However, that group is going to start undergoing what we politely term “generational replacement” – it’s going to start dying. When it does, who will pick up the stein and carry on? I don’t know how much is too much. Maybe we can carry on like this for a while yet. Maybe beer – especially craft beer – will keep finding new customers and bringing them over to its side. Maybe existing beer drinkers will happily continue paying a growing premium for “good” beer, keeping profits high and smaller, local breweries solvent despite declining unit sales and static (or shrinking) markets. Maybe we’ll enter a period of correction where breweries will sort themselves out, consolidate, and transition to a more-sustainable model. I mean it, though: I don’t know. I’m not claiming that we’ve hit a saturation point for craft beer. I do know this, though: there’s more beer out there that I want to drink than I can in any given year. There are entire breweries that I’ve never or only intermittently tried, even when they’re fairly local. I’m sure that beer observers have said this very thing once a week for years, but it genuinely feels to me like we’ve reached a tipping point. Those trains may be further apart than I think. It’s possible they’re not actually headed for a collision, and the market will rationalize rather than convulse. I suppose it’s also possible that the questions about craft beer quality are both overstated and that breweries will mature and improve, proving this to be just a temporary blip caused by a sudden influx of new players coming into the market. I don’t buy that, though. I think that brewery investors should start looking for outs. I think that brewery employees should start thinking about other industries that can use their hard-earned skills. I wonder if we have forgotten that the free market is a Darwinian place; there was so much room out there on the beer savanna for craft breweries to romp and play, with few predators in sight and hops fields as far as the eye could see and rivers of wort pouring, seemingly endlessly, to the horizon. Who wants to think about a time when we’ll have to fight it out for resources, customers, and our own survival? Who wants to ask if that day is soon to come? Who wants to ask if it’s already here? Now, though, the free market hyenas may well be at the door. I don’t know what will happen next, but if nature is any guide, this may get messy.